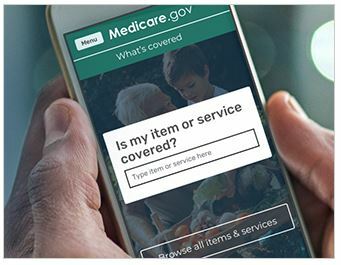 Get Medicare’s New, And First Official, “What’s Covered” App! Is your medical item or service covered by Medicare Part A and/or Part B? Now there’s a quick way to check! Medicare’s free “What’s Covered” app delivers accurate cost and coverage information right on your smartphone. Now you can quickly see whether Medicare covers your service in the doctor’s office, the hospital, or anywhere else you use your phone. 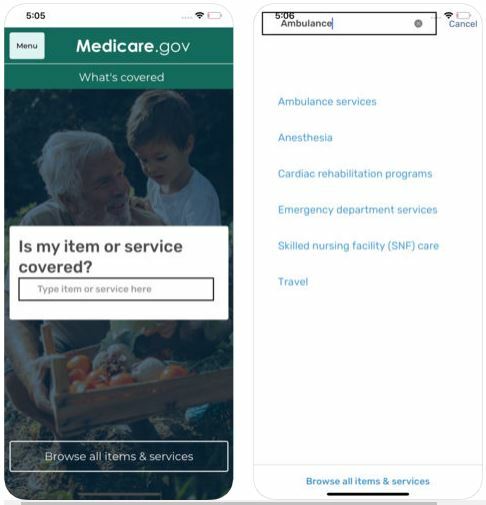 The “What’s Covered” app is the only official U.S. government Medicare app. The “What’s Covered” app helps you understand the health care coverage offered by Original Medicare Part A (Hospital Insurance) and Part B (Medical Insurance). Preventive Health Coverage: Medicare coverage includes many common preventive services at no cost to you. Preventive services can help keep you healthy by finding health problems early, when treatment works best, and can keep you from getting certain diseases. Part A & Part B Costs: Medicare Part A and Part B cover certain medical services and supplies in hospitals, doctors’ offices, and other health care settings. Part A hospital insurance coverage helps pay for inpatient care in a hospital, inpatient care in a skilled nursing facility, hospice care, home health care, or inpatient care in a religious non-medical health care institution. Copayments, coinsurance, or deductibles may apply for each service covered by Part A.
Medicare Advantage Plans: If you have a Medicare Advantage Plan or other Medicare health plan, you have the same basic health care coverage as people who have Original Medicare, but the rules vary by plan. Some Medicare Advantage Plans offer extra benefits that Original Medicare doesn’t cover – like vision, hearing, or dental. Check with the plan or search in the App Store to see if the plan has a similar mobile application. Download Medicare’s official “What’s Covered” app — available for free in both the Apple App Store and Google Play. The “What’s Covered” is part of the agency’s eMedicare initiative—launched in 2018—which is aimed at empowering beneficiaries with cost and quality information.